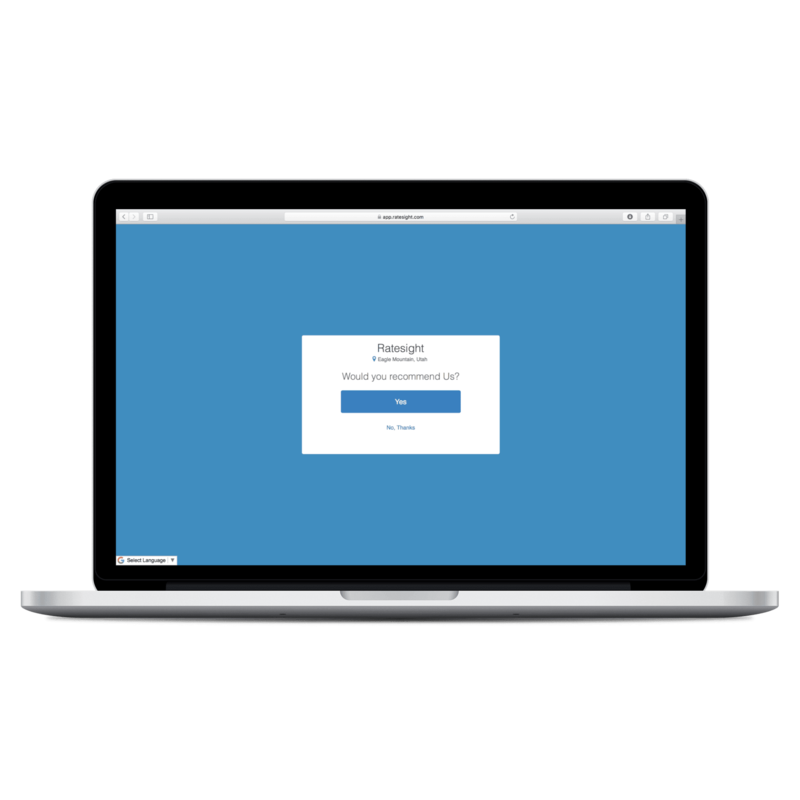 Let the Ratesight platform help everyone know how great you are. Getting more reviews starts with customer engagement and satisfaction. You work hard to provide the very best product or service to your customers. 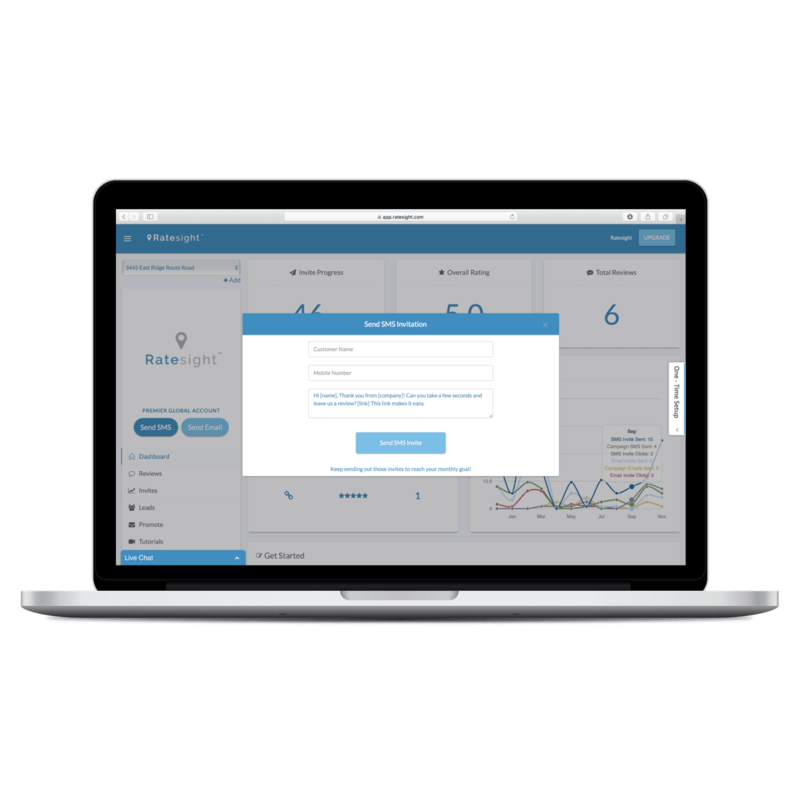 Let the Ratesight platform help everyone know how great you are. The platform sends a customizable SMS or email message to start the feedback process simply by adding in the customer’s mobile phone number or email address. It’s just that easy! Enter either a single mobile number, email or entire customer list upload to start. If you don’t have many customers contact information, we provide web page integration for lead generation and app support for in-person kiosk needs. Once you have entered your customer into the system, they can then receive on-going messages for marketing purposes. Your customer is then asked how likely they are to rate your business and refer a friend. This helps them to easily comment on their experience making this process easy for them and for you. Ratings help to increase your presence on the web and give potential customers a positive outlook on what they will experience. Your preselected review sites such as Google and Facebook are easily available for the customer to choose from. The customer then decides where they would like to write a review. A less than recommended experience is captured in a private area of the dashboard where you can quickly follow-up with the customer and resolve any issues. Track, build and evaluate your reviews with valuable dashboard statistics focused on your business. Display your new and existing reviews directly on your website with our built-in website integration technology. Get alerted when customers write less than noteworthy reviews and follow-up to resolve any concerns. Your pre-selected 3rd party review sites will then be displayed for the customer to choose to allow them to write a positive rating. High reputation sites like Google and Facebook are offered as optional places where customers can rate you. This makes it easy for your customers to quickly make a decision and get straight to the important part. Your online reputation is boosted when you have a steady stream of consistent online customer reviews. 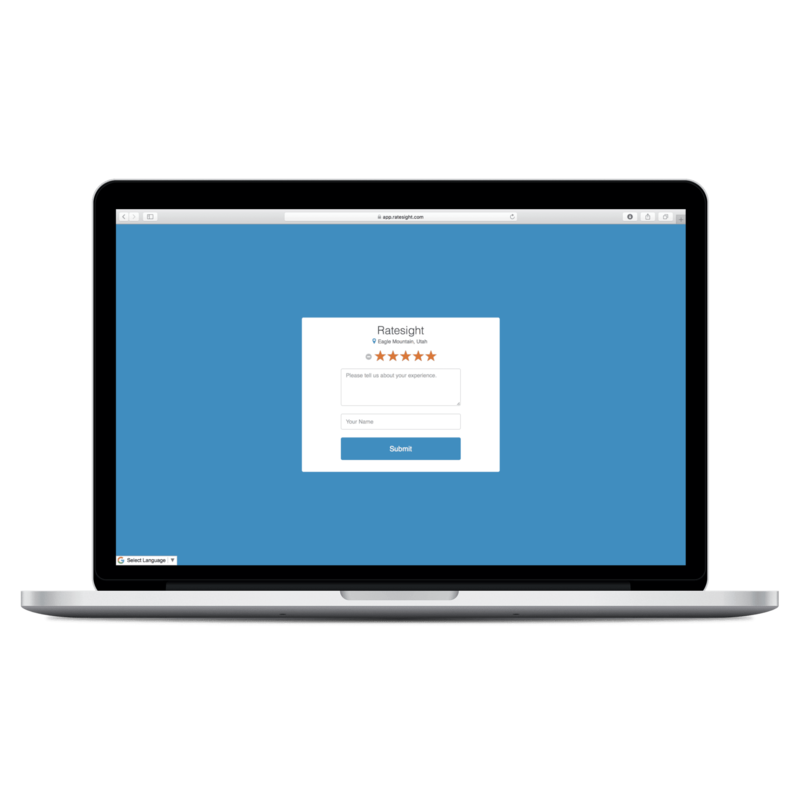 Happy customers are given an easy path to leave a review at your desired high reputation sites. Integration with sites like Google, Facebook and Yelp combines a powerful connection for your business reputation. Consistency is key when building your company’s reputation. Long-term use or Ratesight improves your SEO and potential customer visibility. Easily display customer testimonials directly on your website with our built-in website integration. Simply copy and paste the code onto any relevant page or your website for potential customers to see. We recommend you have a reviews page which makes it easy for customers to find. 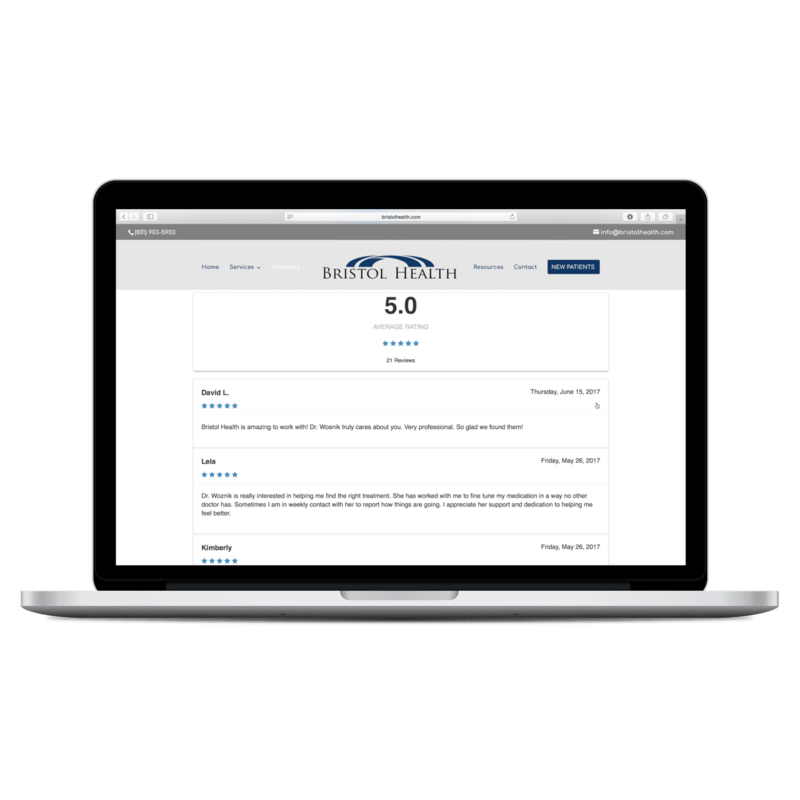 Displaying your reviews on your website is quick and easy. You can control where and what reviews you would like to have displayed with your new built-in integration. You can manually approve testimonials and display them powerfully on your business website. Just copy and paste a short line or code onto your website and you’re all set. This integration is mobile-friendly. Your fresh new content is now easily added to your website. Enjoy SEO friendly new content with each new review. 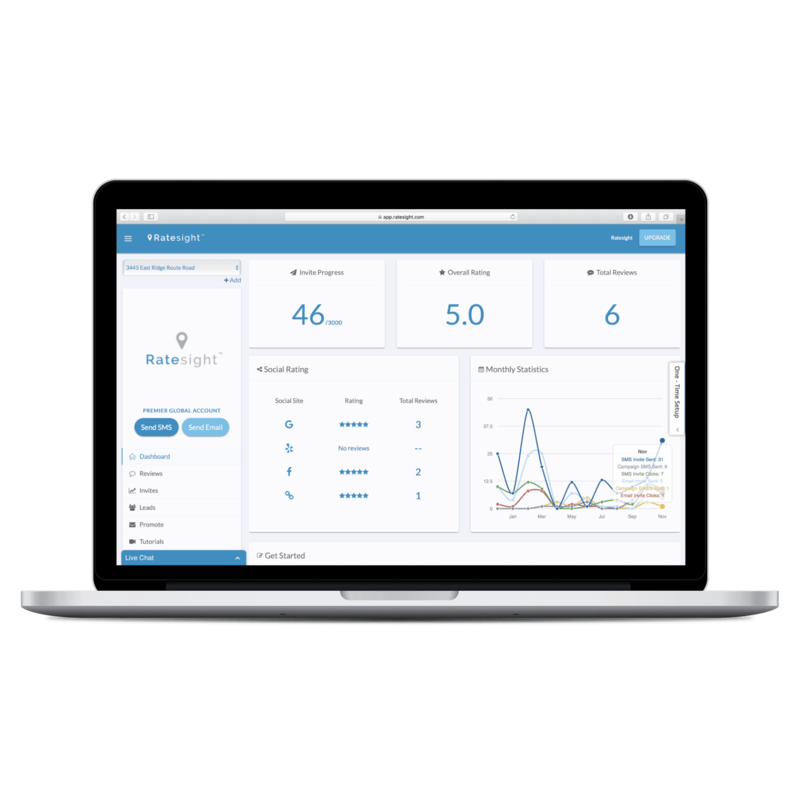 Ratesight gives you one simple yet powerful tool to monitor your customer’s feedback and reviews. Each and every one of your locations will benefit from the same platform, features and benefits. Multiple locations will have the power to encourage more positive online reviews and get more customer attention. No more guessing and waiting to hear from your satisfied customers. By leveraging Ratesight you are helping to encourage your customers to share their experience. This feedback ensures you are meeting their needs and growing your brand. Our platform offers you easy-to-view statistics on your businesses customer feedback, online reviews and overall online ranking. We provide you with valuable monitoring tools to respond to new reviews posted on your business. Managing multiple locations is fast and easy. No matter how many locations, enjoy valuable data and reporting.